A cold-weather classic, the UGG® Australia Essential Short boot is truly an essential piece of your fall and winter wardrobe. 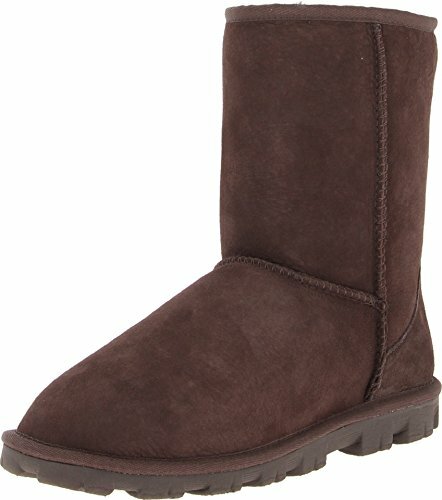 Soft suede upper in a casual pull-on boot style. Twin-face sheepskin can be cuffed to reveal the fuzzy interior lining. UGG logo patch at heel. Color may vary. Soft sheepskin lining is plush and warm. Cushioned footbed. Rugged EVA outsole with extra tread for improved traction. Imported. Real sheep fur or lamb has been artificially dyed and treated. Fur origin: Australia, European Union or United States. Measurements: Heel Height: 3⁄4 in Weight: 12 oz Circumference: 15 in Shaft: 8 1⁄2 in Product measurements were taken using size 7, width B - Medium. Please note that measurements may vary by size. Soft sheepskin lining is plush and warm. Cushioned footbed. Rugged EVA outsole with extra tread for improved traction. Imported. Real sheep fur or lamb has been artificially dyed and treated. Fur origin: Australia, European Union or United States. Measurements: Heel Height: 3⁄4 in Weight: 12 oz Circumference: 15 in Shaft: 8 1⁄2 in Product measurements were taken using size 7, width B - Medium. Please note that measurements may vary by size.